The selection committee for the Hockey Hall of Fame will meet on June 26 to figure out what the Class of 2018 will look like. It appears to be a difficult year to come up with the best choices. This is a much easier process when veteran observers look at the qualifications of a particular player, and without any thought say, “Yup, he’s a Hall of Famer.” But that does not cover everyone, especially this time. There are plenty of people on the margins. I’ll use two techniques for coming up with a possible list of those who could go. I’ll break it up into four categories. There are the cinches – players who will get in without an argument; the comets – those who were absolutely brilliant for a relatively short period of time (think Pat LaFontaine and Eric Lindros); the compilers – performers who were pretty good but not outstanding for a long period of time and thus have excellent career stats; and the curiosities – those who might not fit in anywhere else but still get extra points for one reason or another. I like to use a formula that allots two points for a first-team all-NHL selection, and one point for a second-team pick. This does a great job of identifying the cinches and comets, but is weak when it comes to the compilers and curiosities. It’s in the tool box. Martin Brodeur – He has the most career wins, the most career games, and the most career shutouts among goalies in NHL history. Martin earned 10 points in the formula (three firsts, four seconds). You might not call Brodeau the best goalie ever (Hasek? Roy? Sawchuk? ), but he might be your pick if you needed a goalie to start your franchise and last for close to two decades. He’s the only one this year that belongs in this group. Martin St. Louis – He made all-league teams five different times (one first, four seconds for six points), but fell short of 400 goals. Martin also had only one 40-goal and 100-point season. It’s a slightly odd looking career, similar to players such as Pavel Datsyuk and Bryan Trottier according to hockey-reference.com. Alexander Mogilny – Buffalo, you may have heard of him. He had 76 goals and 127 points in 1992-93, at a time when league scoring totals seemed to be on steroids. He crossed 40 goals in two other seasons on his way to 473 goals and more than 1,000 points. Injuries probably cost him 500 goals, and there was always a feeling that he should have been a better player than what he was (a pair of second-team all-NHL picks). Did he do enough? John LeClair – The big left winger was all-league five times (two firsts, three seconds for seven points). He came into his own when paired with Lindros in Philadelphia, and had five great seasons on the “Legion of Doom” line. But he never got past 25 goals after that, and finished with “only” 333 goals. I’d guess that St. Louis makes the finals of the discussion, and the other two will have to wait. Daniel Alfredsson – Played all but one season of his career with the Senators, finishing with 1,178 games, 426 goals and 1,128 points. In other words, Daniel was very good for a long time. But, would you call him one of the elite players in the league? He only had one season above 40 goals and 90 points, and was a second-team all-NHL pick once. Jeremy Roenick – He was a comet at the start, with three 100-point seasons before the age of 25. Jeremy didn’t keep that level up, but he was good for a long time and finished with 513 goals and 1,216 points. The center never was an all-NHL pick, and played for five different teams. Curtis Joseph – He had a career something like Alfredsson, in that he was certainly a very good goalie for years and years. (Cujo had no all-NHL picks.) No wonder he won 454 games, and he did it with some teams that were less than Cup contenders most of the time. Keith Tkachuk – His name came up when discussing the best power forwards of his era. Keith finished with 538 goals, which certainly will get the attention of the Hall voters. Again, he wasn’t part of any great teams. By the way, Pat Verbeek finished with similar numbers (522 goals), but it would be tough to see him picked before Tkachuk. Doug Wilson – He may have spoiled us, when he scored 39 goals in 1981-82 as a defenseman in winning the Norris Trophy. Wilson never duplicated that figure, but he still finished with 816 points in 1,024 games. Doug was a first-team all-NHL pick once and a second-teamer twice for four points. It feels as if Alfredsson is the next one to go, but I don’t see much difference here. This mostly applies to European players. The best of the bunch, and the one receiving the most talk this year, is Boris Mikhailov of the Soviet Union. He was a big part of the great teams of the 1970s. Remember how Herb Brooks told Team USA in Lake Placid that it should be afraid of a guy who looked so much like Stan Laurel? One interesting question – does Mogilny’s defection from the Soviet Union give him points in the curiosity category? He was the first player to make a jump from there. I won’t try to guess about a pick in women’s hockey, but – familiar last name coming – Jennifer Botterill’s five world championships for Team Canada ought to get her on that short list. Yup, she’s Jason’s sister. You could win a bet by pointing out that Pierre Turgeon finished with more career goals than Gil Perreault (515-512). Pierre also had 812 assists for 1,327 points to fit into the compiler list. Still, would you trade him for any of the guys listed there? Speaking of questions – if goalie Chris Osgood is going to get a look by the selection committee, shouldn’t Tom Barrasso also examined? Barrasso won 369 games and two Stanley Cups to Osgood’s 401 and three, and he didn’t have a great team in front of him for all of his career. Speaking of ex-Sabres, Slava Kozlov and Robyn Regehr both played more than 1,000 games, while Daniel Briere finished with 696 points. All are eligible for the first time this summer. Other names that might come up in conversation are Theo Fleury, Sergei Zubov, Sergei Gonchar, Rod Brind’Amour, Steve Larmer, Petr Bondra, Bernie Nicholls, Vincent Damphousse, Mike Vernon and Andy Moog. They all seem likely to wait a while longer, at best. 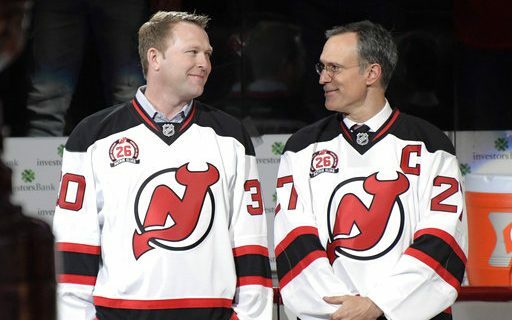 Brodeur is a sure thing. If there are three more spots open (not including women, executives, etc. ), I would pick St. Louis, Alfredsson and Mikhailov. For lists of those who haven’t made the Hockey Hall yet, click the appendix to the story.